The big bang could be a normal event in the natural evolution of the universe that will happen repeatedly over incredibly vast time scales as the universe expands, empties out and cools off, according to two University of Chicago physicists. ?We like to say that the big bang is nothing special in the history of our universe,? 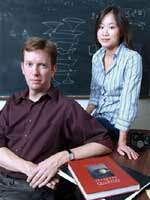 said Sean Carroll, an Assistant Professor in Physics at the University of Chicago. Carroll and University of Chicago graduate student Jennifer Chen will electronically publish a paper describing their ideas at http://arxiv.org/. Carroll and Chen?s research addresses two ambitious questions: why does time flow in only one direction, and could the big bang have arisen from an energy fluctuation in empty space that conforms to the known laws of physics? The question about the arrow of time has vexed physicists for a century because ?for the most part the fundamental laws of physics don?t distinguish between past and future. They?re time-symmetric,? Carroll said. And closely bound to the issue of time is the concept of entropy, a measure of disorder in the universe. As physicist Ludwig Boltzmann showed a century ago, entropy naturally increases with time. ?You can turn an egg into an omelet, but not an omelet into an egg,? Carroll said. But the mystery remains as to why entropy was low in the universe to begin with. The difficulty of that question has long bothered scientists, who most often simply leave it as a puzzle to answer in the future. Carroll and Chen have made an attempt to answer it now. Previous researchers have approached questions about the big bang with the assumption that entropy in the universe is finite. Carroll and Chen take the opposite approach. ?We?re postulating that the entropy of the universe is infinite. It could always increase,? Chen said. To successfully explain why the universe looks as it does today, both approaches must accommodate a process called inflation, which is an extension of the big bang theory. Astrophysicists invented inflation theory so that they could explain the universe as it appears today. According to inflation, the universe underwent a period of massive expansion in a fraction of a second after the big bang. But there?s a problem with that scenario: a ?skeleton in the closet,? Carroll said. To begin inflation, the universe would have encompassed a microscopically tiny patch in an extremely unlikely configuration, not what scientists would expect from a randomly chosen initial condition. Carroll and Chen argue that a generic initial condition is actually likely to resemble cold, empty space?not an obviously favorable starting point for the onset of inflation. In a universe of finite entropy, some scientists have proposed that a random fluctuation could trigger inflation. This, however, would require the molecules of the universe to fluctuate from a high-entropy state into one of low entropy?a statistical longshot. ?The conditions necessary for inflation are not that easy to start,? Carroll said. ?There?s an argument that it?s easier just to have our universe appear from a random fluctuation than to have inflation begin from a random fluctuation.? Carroll and Chen?s scenario of infinite entropy is inspired by the finding in 1998 that the universe will expand forever because of a mysterious force called ?dark energy.? Under these conditions, the natural configuration of the universe is one that is almost empty. ?In our current universe, the entropy is growing and the universe is expanding and becoming emptier,? Carroll said. But even empty space has faint traces of energy that fluctuate on the subatomic scale. As suggested previously by Jaume Garriga of Universitat Autonoma de Barcelona and Alexander Vilenkin of Tufts University, these flucuations can generate their own big bangs in tiny areas of the universe, widely separated in time and space. Carroll and Chen extend this idea in dramatic fashion, suggesting that inflation could start ?in reverse? in the distant past of our universe, so that time could appear to run backwards (from our perspective) to observers far in our past. Regardless of the direction they run in, the new universes created in these big bangs will continue the process of increasing entropy. In this never-ending cycle, the universe never achieves equilibrium. If it did achieve equilibrium, nothing would ever happen. There would be no arrow of time. ?There?s no state you can go to that is maximal entropy. You can always increase the entropy more by creating a new universe and allowing it to expand and cool off,? Carroll explained.